Since having a baby, what summer is has changed for me. It's no longer drinking beers on a patio somewhere, taking night walks and participating in general, warm-weather shenanigans. Now it's more, um, do the same stuff every day except not hate it as much going outside because I'm not freezing to absolute death. I loved summer. Like, loved loved it. I dreamed about it during every other season. And I still do, really, it's just different. So, the fact that it's going to start getting colder doesn't affect me as much because, like I said, it's not really going to change how I spent my days. No more hiding from thunderstorms or hordes of spiders, so that's pretty cool. Also Fall is my second fave (maybe first fave-tied) so, you know, whatever. It's all peachy. OH PLUS APPLE PIEEE. 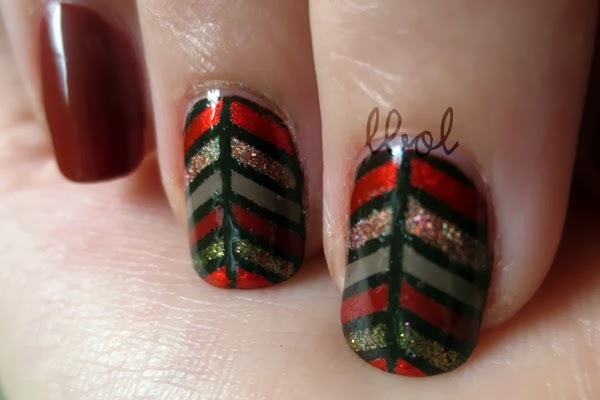 Here's an Autumn inspired NOTD using a bunch of untrieds I have. and the dark brown underneath it all is Barielle - Coco Bar. 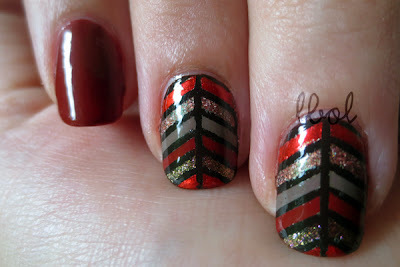 Looking through my polish stash on Pinterest, I have sooo many flipping fall colors I haven't tried yet. Geez Louise, guys! I need to get it together. THANKS. <3 I thought about making little trees, and then little leaves, and then I was all just like LINES. I sure love lines. It is pretty leaf-like already!